MEDRAD, one of the world’s leading suppliers of advanced medical devices, has specified Rigel Medical 288 electrical safety analysers to improve the safety testing of contrast injectors used at sites across the UK and Western Europe. An initial nine 288s have been supplied to the team of field service engineers in the UK with a further 31 units deployed across the rest of Western Europe as replacements for the previous testers, which have been in use for the past 10 years. Using the new 288s is providing MEDRAD with a highly cost effective, versatile and portable testing solution, enabling engineers to quickly and accurately undertake more than a 1,500 safety tests a year in the UK alone during the routine service and maintenance of MEDRAD’s installed base of contrast injectors. These are used to inject a contrast agent during a CT or MRI scan to intensify the image and, currently, MEDRAD has more than 15,000 on its UK and Europe installed base. A further benefit is that the tester can easily interface with the engineers’ portable printers, which are carried in their laptop bags. Using the Bluetooth facility enables test results to be printed out while the engineer is onsite and left with the customer as part of the field service report. The 288s are also used for testing the electrical safety of MEDRAD’s MRI compliant Veris range of vital signs patient monitors. 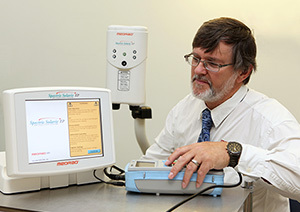 MEDRAD UK Ltd, currently based in Ely, Cambridgeshire, is a manufacturer and supplier of medical contrast injectors for hospitals and other healthcare facilities, which enable or enhance diagnostic and therapeutic medical procedures for computed tomography, magnetic resonance, and cardiovascular applications. Adam Reid, the company’s UK Service Manager, said: “The 288 is an excellent instrument, providing a cost effective, high end testing solution. The engineers find it easy-to-use and appreciate the fact that it’s compact enough to carry around with them. “It incorporates a good range of features for a tester of its size, while the connectivity benefits are particularly impressive. “The ability to import and export data is also a particularly beneficial feature, enabling us to store test information which can then be easily retrieved and used for audit purposes. The Rigel 288 incorporates easy-to-follow menu driven instructions for simple operation and test control of all IEC 62353 required electrical safety tests in manual, semi automatic or fully automatic test modes. Available as part of a special test kit is the new battery operated Test ‘n Tag Elite printer which provides an easy way to generate tamper proof barcode pass-fail labels or result print outs. The Elite printer also has the additional ability to design and print customised logos or contact details on every label printed. This not only gives a clear indication of the electrical safety of the medical equipment, but also a simple way of providing contact details in the event of unexpected service requirements. Each label offers a cost effective way of enhancing customer service and is unique to the Rigel 288. The Elite can also be used with thermal paper for on the spot printing of test results using the industry standard 50mm wide paper. For traceability and safety audit purposes, wireless connection also means that data from the Rigel 288’s large internal memory can be transferred immediately and directly from the tester to PC-based record keeping systems at the touch of a button. The 288 forms part of a comprehensive range of high performance specialist biomedical test equipment supplied by Rigel Medical, part of the Seaward Group. Visit the Rigel 288 Hand-held Electrical Safety Analyser product page for more information.